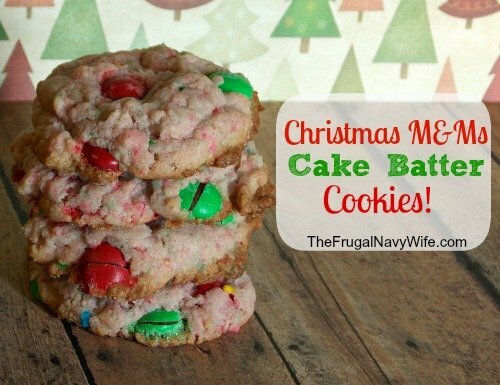 You Are Here >> Home » Easy Meals » Baking » 12 days of Christmas Cookies | Christmas M&M Cake Batter Cookies! It’ December. The race to Christmas is on! Stacy over at Adventures In Coupons and I have teamed up to bring you 12 days of Christmas Cookies! Each day one of us will bring you a yummy new cookie recipe! For Day 9 we have M&M Cake Batter Cookies! This is another great recipe you can mix up the M&Ms to match any holiday! These didn't last long in my house at all! Combine cake mix, eggs, and oil in large mixing bowl, and mix well. Stir in M&M’s and sprinkles if using. Drop onto greased cookie sheet in rounded balls. Bake for 8 – 9 minutes, until done at 350 degrees.